Put on a costume and see a musical this Halloween! 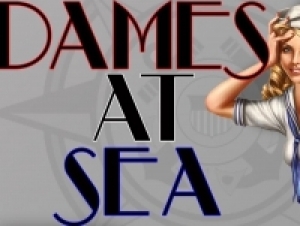 Buffalo State’s 2012–2013 theater season continues with the premiere performance of the Andy Anselmo Musical Theater Production Dames at Sea at 8:00 p.m. on Halloween, Wednesday, October 31, in the Flexible Theatre located in the Donald Savage Theater and Communication Building. "Anyone who wears a sailor costume to the show on Halloween will get a raffle ticket,” said Carlos Jones, director and choreographer of Dames at Sea. After the performance, raffle tickets will be drawn and prizes will be given out. Dames at Sea is patterned after Busby Berkeley movie musicals from the 1930s, which Jones compared to the movies shown on the Turner Movie Classic network. "It's a fun, comical, light-hearted musical," Jones said. "People are going to see dancing, tap dancing, gold diggers, good songs, novelty numbers, and a whole bunch of antics." This musical is possible due to the generosity of Buffalo and New York City radio and musical theater talent Andy Anselmo, who trained musical legends such as Liza Minnelli and Tony Bennett and actors Alec Baldwin and Regis Philbin. Anselmo has taught vocalmaster classes on the Buffalo State campus and recently made a significant contribution to the Theater Department so that its students can produce an annual musical. Jones said he took advantage of Anselmo’s support by having the cast develop their skills in unique ways. For example, he double-cast the actors so that the 12 cast members each have two roles: one lead and one ensemble character. "The shows rotate," Jones said. "On nights that one cast plays the leads, the rest are supporting characters." "We experience the show from both perspectives," said Mandi Hess, who shares the lead role, Mona Kent, with Raquel de Souza. "You see the other person who's playing your role do something you never thought of, which helps you develop your character." "If you’re a lead on Broadway you’ll always have an understudy," de Souza added. "This is similar to that, a real life experience." In addition, the show's location gives the cast a chance to perform in an unusual setting. Instead of performing to an audience only in front of them, the cast will also perform for an audience to the left, and to the right. "You have to be conscious of the fact that if you turn one way, people may not be able to hear you or see your face," Hess said. "This is a fun show and experience. It’s definitely not boring!" Performances will take place at 8:00 p.m. October 31 to November 3, and November 7 to 10. There will also be 2:00 p.m. performances on November 3 and 10. Dames at Sea is approximately an hour and a half in length.